Treat yourself or someone special to an unforgettable experience savouring the power of heritage diesel traction or the true magic of steam. Our Experience Days are designed for moderately fit men and women (aged 18 or over) to experience aspects of the railway that are unseen by the majority of our visitors. Don’t just watch and photograph our locos, climb aboard and become Driver for the day! Experience life as the Driver and Secondman of a heritage diesel locomotive built for British Railways over 40 years ago. 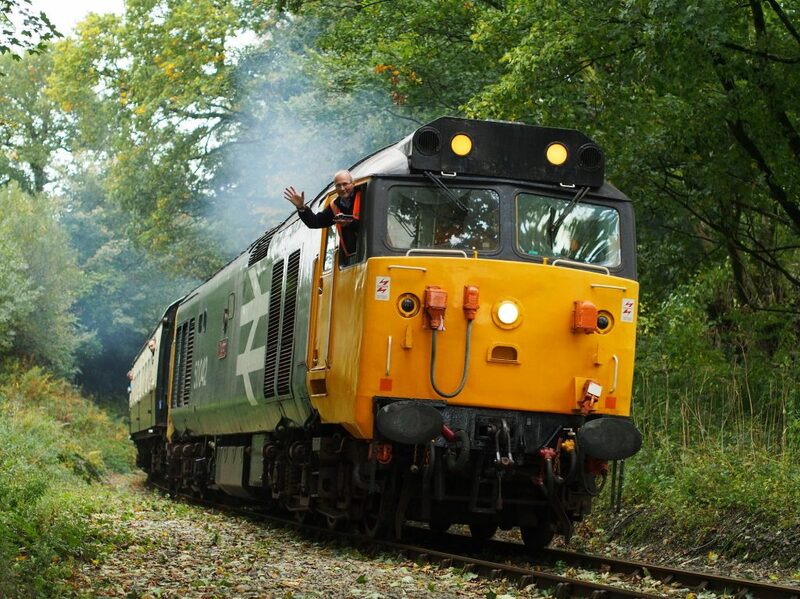 Experience the power and feel the surge of adrenalin as you take the controls of a working former main line diesel, joining the crew in the cab for a day out to remember. With challenging gradients as steep as 1 in 37 and a three-coach train you’ll hear the roar of the English Electric or Sulzer engine as you push the power handle. During the course of the day you will experience work as a Driver, Secondman and Guard, and will visit the signal box, guided and encouraged by our fully qualified crew. The day consists of two or three light engine runs over one of our lines and the locomotive is then coupled to the carriages for the afternoon trips. All courses are one day in duration, usually between 8am and 5 pm. When do the experience days take place? Dates are by arrangement, usually in February, March, April (Steam only), October & November. Each experience usually has three participants. If you’d like to be put on the same engine as friends who are booking separately, please let us know when booking. Accompanying guests are welcome to share the experience and may travel on the train free of charge. Lunch and refreshments are provided to all participants. We can cater to most dietary requirements (including gluten free and vegan) with advance notice, just make sure you let us know when you book. Are there any restrictions about who can take part? Participants must Be at least 18 years of age (if under eighteen please contact our office). FOR DIESEL – Be physically fit and be able to climb a 6ft vertical ladder. This activity may not be suitable for those with some disabilities, particularly where these affect mobility, concentration, dexterity and co-ordination. If you believe this may be a factor for the participant, please contact us in advance to ensure the activity is suitable. Each experience includes a full day of activity, Lunch and refreshments throughout the day, a certificate of completion, free travel onboard for your friends and family, and to mark the occasion, each participant is presented with a certificate at the end of the day. The cost of the experience also includes a year’s membership of the Bodmin Railway Preservation Society (BRPS). Membership of the BRPS provides additional benefits including an excellent magazine three times a year, volunteering opportunities and travel concessions. It is inevitable that you will get dirty – old clothing, with protective overalls and gloves, and strong footwear are essential. Will it involve active participation? Yes. You will need to climb onto, underneath and around the locomotive. On the Steam Footplate Experience, you will be involved in active participation in the preparation, firing, driving and disposal of a steam locomotive. You will be exposed to heat, water and ash. You will have to handle heavy tools and shovel coal. On both experiences, all reasonable safety precautions will be taken. You will be under constant supervision, but it must be pointed out that this activity has potential hazards, although no more so than other active occupations or sports. You must be prepared to accept instructions from those in charge, which will be for your own benefit. Instructors are qualified and experienced BWR Drivers and Enginemen/Secondmen. What happens if I need to cancel the experience? the full course fee if cancelled 7 days or fewer before the booked course date. The full course fee if cancelled fewer than 7 days before the booked course date. These charges may be waived in the event of extenuating circumstances, at the discretion of the BWR. What happens if the BWR needs to cancel the Experience? Whilst every effort will be made to operate our courses on the dates advertised and agreed, there may be occasions when we have to curtail or cancel a course for operational reasons. If we cancel your course, we will offer you an alternative date or a full refund of the course fee, however we are unable to reimburse travel or accommodation charges associated with a curtailed or cancelled course. STEAM – A £100 non-refundable deposit is required at the time of booking with the balance payable four weeks before the date of the course. DIESEL – The full course fee is payable at the time of booking. Find out more about our Steam Footplate Experience Days.